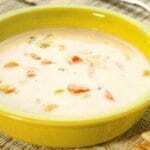 Cream of Broccoli Soup | JPMA, Inc. Mix broccoli, mixed vegetables, and light cream of mushroom soup in a saucepan. Fill the soup can with milk and add to saucepan. Stir over low heat until steaming hot and vegetables are cooked. • Use 2 cups of cooked, fresh broccoli instead of frozen broccoli. • Replace 2 cups of mixed vegetables with 2 cups of your favorite vegetable. This material was funded by USDA’s Supplemental Nutrition Assistance Program - SNAP. SNAP helps low income people buy nutritious food for a better diet. To get more information contact the CT Department of Social Services at 1- (855) 626-6632 or WWW.CT.gov/dss . USDA does not endorse any products, services, or organizations. Provided by Department of Public Health in partnership with the University of Saint Joseph. This institution is an equal opportunity provider.